Security forces arrive at 14 Riverside Drive, which was attacked on January 15, 2019. 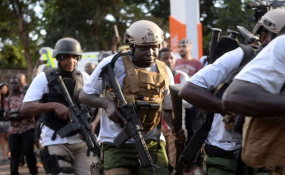 Nairobi, Kenya — On 15 January 2019, terror struck Nairobi's 14 Riverside Drive. Kenya is in mourning following a senseless act on innocent and defenseless civilians by individuals preoccupied with contemptible and misplaced ideology; who hope to intimidate others through violent acts of terror. Like in their other past attempts, they have failed, and Kenya remains unbowed. As President Kenyatta has noted in his address; "We will allow no one to derail or frustrate our progress... .We have prevailed and shall always prevail over evil. Let us now go to work without fear and continue with our work of building our nation." The reality is that a multitude of stresses impact vulnerable populations around the world, leaving many disproportionately susceptible to extremist ideologies -- driven by factors such as surging youth unemployment -- which terror groups take advantage as a considerable reservoir for recruits. There is a need for concerted efforts to weaken the terror groups' narrative and win the battle of ideas.